Lake Superior is the largest of the Great Lakes of North America and the largest freshwater lake in the world in area, if not counting the Caspian Sea. The water volume of Lake Superior is so huge that it would be enough to fill all other lakes in the group - Lake Michigan, Lake Huron, Lake Erie and Lake Ontario, Plus two additional lakes as large as the second smallest - Erie. With its 12100 cubic km volume, Lake Superior ranks third in the world on water capacity. The northern border of Lake Superior reaches Ontario, in Canada and Minnesota, in the U.S. In the south boundaries remain with the states of Wisconsin and Michigan in the USA. Lake Superior has been formed by the melting of ice about 4000 years ago, and today is located at 183, 5 meters above sea level. The total area of it’s giant basin amounts to 82, 400 square kilometers. In terms of depth Lake Superior is again a record setter - its maximum depth is 406 meters (an average of 147 m), which logically implies it is the coldest lake in North America. The maximum length of Lake Superior amounts to 563 km, and maximum width reached, 257 km. This area has collected so much water that it is enough to cover the area of the Americas with water about 30cm deep, the coastline of it’s giant basin is estimated at 4387 km, including it’s islands. Lake Superior is frozen between December and April. 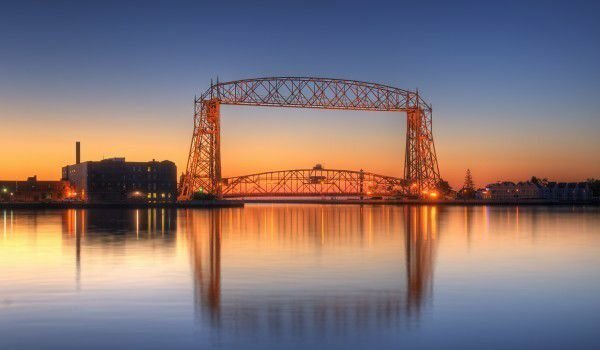 The most important ports on it are Ashland, Duluth, in the U.S., and Thunder Bay, in Canada. Clean fresh water of the lake is the cause more than a few National Parks and protected areas can be found around the lake. Among them are Isle Royale (island of the same name, part of USA), and Pukaskwa, which is located in Canada. The Ojibwe people called Lake Superior Gichigami, which translates as "the big water". The first French explorers who reached the shores of this vast inland sea via the Ottawa River and Lake Huron, named the lake Superior during the 17th century. During the French regime the water basin was also known as "Lac Tracy". After landing on the mainland, the British approved Lake Superior by this name because it was already known that "further down" there was another lake. More than 200 rivers fill the waters of Lake Superior, the largest among them are Nipigon River, St. Louis River, Pigeon River, Pic River, White River and others. The pool is drained into Lake Huron through the lower St. Mary’s River. Biggest island in Lake Superior is Royale, located in Michigan. The island itself contains several lakes, which in turn also have internal islands. Other large islands are Madeline Island in Wisconsin and Michipicoten - in the province of Ontario. Shipping is widespread in Lake Superior, as through it pass important routes for heavy and light industry. Many shipwrecks lie on the bottom of the water pool, as many ships were lost around Cape Whitefish, also known as "Tomb of the Great Lakes”. Moreover, there is something of a tradition that Lake Superior rarely gives up it’s dead. Keeping in mind that for the body to form bacteria a mild average temperature is required, this bacteria then releases gas which causes human flesh to emerge within around three days. In Lake Superior, the temperature is very low (-36 degrees) and suppresses the growth of bacteria, as a result of which bodies do not reemerge. The enormous wealth of fish in Lake Superior includes over 80 species - trout, whitefish, salmon, carp, sturgeon, herring and even many others. Some of these are deliberately or accidentally bred in the lake. 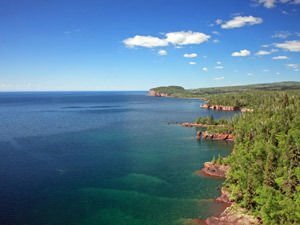 Because of its huge volume Lake Superior has less scattered nutrients and plankton, which makes it less productive for fish populations. Along Lake Superior there are many places that are designed for leisure and tourist trips. One of them is a provincial park, which bears the same name as the lake. The park covers a 600sq.km. area, in the province of Ontario and includes several Bays, in which were built hundreds of campsites. Most tourist facilities operate only during the summer, but the scientific activities here go on all year round.